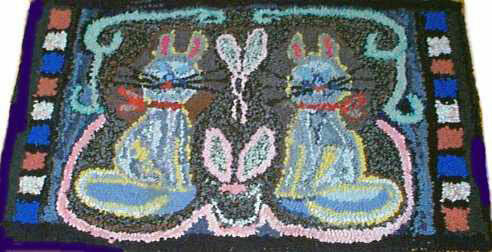 Household pets were often the subject matter for Hooked Rugs of original design. I'm sure that was the case with this very folky hooked rug. The border treatment is especially interesting with it's scrolled effect on the top, the red, white and blue squares along the sides, and the pink ribbon along the bottom. The cats sit very primly . . . they almost seem to be smiling! Of course! They are wearing red ribbons around their necks and know they are pretty! Size of the rug is 22 1/2"wide and 38" long. Condition is excellent.